Three wide tiered slabs form the base of a twenty-five foot high square pillar. The bottom four corners of the pillar are accented with small spheres. The pillar is topped with a six-foot tall Confederate soldier who stands, holding the barrel of his rifle with two hands. Seven units were memorialized on the monument. The county’s first Confederate military force was Company H, Sixteenth North Carolina Regiment; they were honored with their inscription placed directly above the primary inscription. The three remaining sides of the monuments each display an inscription to an infantry unit and below, a cavalry company. Butler, Douglas J. North Carolina Civil War Monuments, An Illustrated History, (Jefferson, North Carolina: McFarland & Company, 2013), 142. Roughly fifteen hundred people were present for the unveiling of the monument, including sixty veterans and the governors of North and South Carolina. The two-part ceremony was conducted by W. A. Curtis. The monument was unveiled by a cord pulled by seven women who were descendents of the commanding officers of the seven companies from Macon County who served in the Civil War. The first part of the ceremony included a speech by North Carolina governor W. W. Kitchin and songs sung by the Franklin Choir. The party broke for a meal in which the veterans and governors dined at the Junaluskee Inn, returning later in the afternoon. Then, Miss Clyde McGuire recited a poem called “The Conquered Banner,” which was the same poem her mother orated twenty years prior at the first reunion of Macon County Veterans. The poems were both recited under a torn flag of the 39th N.C. Regiment. The flag was held by J. W. Shelton, the last remaining color bearer of the regiment. The recitation was followed by a speech given by Governor M. F. Ansel of South Carolina, and sketches of each of the seven companies, written by Major N. P. Rankin. 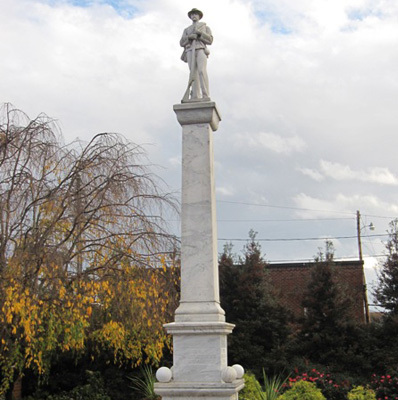 The statue was sold by the McNeel Marble Company from Marietta, Georgia, which produced many other Confederate statues and sold them all over the South, including Pasquotank County Confederate Monument in Elizabeth City, Confederate Soldiers Monument in Hertford, Perquimans county, Alamance County Confederate Monument in Graham, and Confederate Monument in Durham. The monument is located next to the old courthouse, which is currently the Macon County Historical Museum. The monument is surrounded by a brick walkway lined with landscaped plants.